Forty-five Utahns who are at least 100 years old attend lunch. Steve Griffin | The Salt Lake Tribune !00-year-old Lyle Glines waits his turn to be congratulated by Utah Gov. Gary Herbert and First Lady Jeanette Herbert during the 25th Annual Centenarians Day celebration at the Multi Agency State Office Building in Salt Lake City, Utah Friday, August 26, 2011. 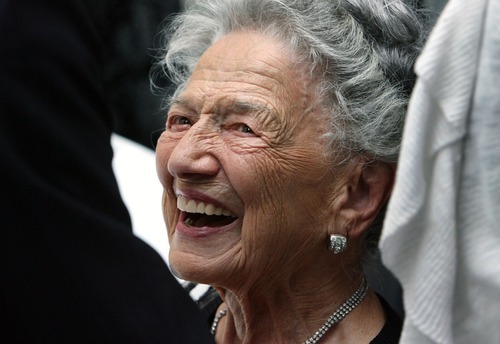 Steve Griffin | The Salt Lake Tribune 100-year-old Nora Delpiaz smiles as she talks with Utah Gov. Gary Herbert and First Lady Jeanette Herbert during the 25th Annual Centenarians Day celebration at the Multi Agency State Office Building in Salt Lake City, Utah Friday, August 26, 2011. Steve Griffin | The Salt Lake Tribune Erna Huck, of Salt Lake City, smiles as she recognizes a friend during the 25th Annual Centenarians Day celebration at the Multi Agency State Office Building ,in Salt Lake City, Utah Friday, August 26, 2011. 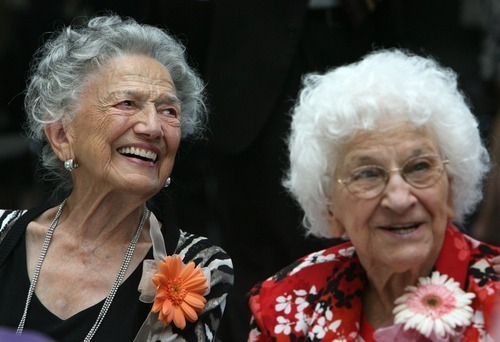 Steve Griffin | The Salt Lake Tribune 100-year-old Nora Delpiaz and Regina Kloepfer smile as they talk with friends and family during the 25th Annual Centenarians Day celebration at the Multi Agency State Office Building in Salt Lake City, Utah Friday, August 26, 2011. 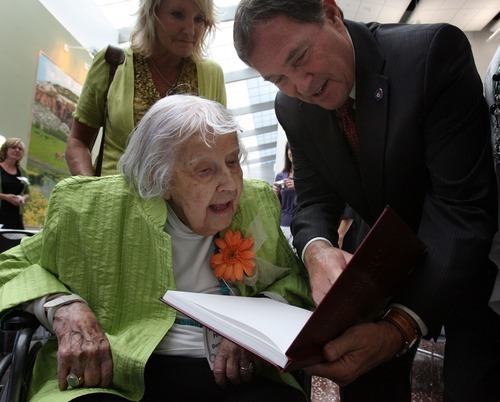 Steve Griffin | The Salt Lake Tribune Margarete Hicken, who was born in Pforzheim, Germany in 1906, looks over her book "I May be Old Some Day" with Utah Gov. Herbert at the 25th Annual Centenarians Day celebration at the Multi Agency State Office Building, in Salt Lake City, Utah Friday, August 26, 2011. Hicken, who wrote the book, gave it to the governor during the event. Live to be 100 and you are not just a witness to history, you help make it. Take Francis McGregor, who passed the century mark on June 11. The Ogden native worked for the Army Corps of Engineers for 34 years, built the dikes around the Provo airport and envisioned the reservoir that the Little Dell dam filled. Nobody would listen when he first told the Corps that the airport was graded below Utah Lake's high-water mark. "In 1947," McGregor says, "fish were swimming across the runway." McGregor was among the 45 centenarians who, with their families and friends, attended the 25th annual birthday party Friday for Utahns at least 100 years old. Gov. Gary Herbert and first lady Jeanette Herbert were the hosts of the lunch, held at the state office complex at 1950 N. Temple. According to census data, Utah has at least 155 residents over the age of 100, with 144 known to Utah Division of Aging and Adult Services. The oldest Utah woman, Edna S. Decker, is 108; the oldest man, Eldred Smith, is 104. "It is indeed incredible to consider the historical events that have occurred in the lifetime of our centenarians," the governor said. "World wars, great inventions, athletic records, national achievements. This event and these Utahns inspire me." McGregor, who has nine grandchildren, 16 great-grandchildren and eight great-great-granddaughters, was married to his late wife, Hazel, for 78 years. "I have to give her credit," McGregor said. "She was wonderful." Oatmeal mush, he said, was key to his longevity. "I'm the only one in my family who ever lived this long," he said. "I'd kind of like to pass on, see what the next chapter's like." 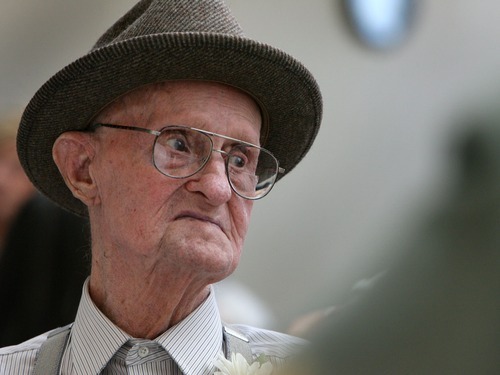 As Utah Aging Services officials noted, today's centenarians have witnessed the arrival of indoor plumbing, electricity and the automobile and lived through two world wars and the Great Depression. Lorna Alder lived through the Mexican Revolution of 1910. In fact, she met Pancho Villa. Born May 28, 1906, in a Church of Jesus Christ of Latter-day Saints colony in northern Chihuahua, Alder recalled when Villa first came to the village. Her father, a bishop, let the revolutionary leader house his generals in a storage building. Villa was handsome, she said. "He liked animals." The second time Villa swept through the region, he killed Anglo ranchers and stole their livestock. Alder's father told the colony residents to leave their lights on and pray. Villa passed them by. Alder, who studied and taught elementary education, arts and crafts at Brigham Young University for 35 years, met a couple of other prominent Mexicans: Frida Kahlo and Diego Rivera, who displayed their paintings at the Benjamin Franklin Library in Mexico City, built as part of President Franklin D. Roosevelt's Good Neighbor Policy. The two Mexican Renaissance artists, whose marriage was notoriously stormy, built side-by-side studio homes in the city with an arch-like bridge connecting the roofs. "We were acquaintances. They were very interesting people. It's funny how they had their homes and had that arch," said Alder, who cooked meatloaf for Rivera, "a big, fat heavy man" who "thought he knew it all." By the end of her interview Friday, Alder and her two sons were the last guests still at the party. She has come to every centenarian bash since she turned 100 five years ago, and likely will come next year, too. Gov. Gary Herbert and first lady Jeanette Herbert were the hosts of Centenarian Day on Friday. The annual lunch party honors Utah residents who are at least 100 years old. This year 45 centenarians attended. Census data show there are at least 155 Utahns who are 100 or older, 144 of them known to the Utah Division of Aging and Adult Services. 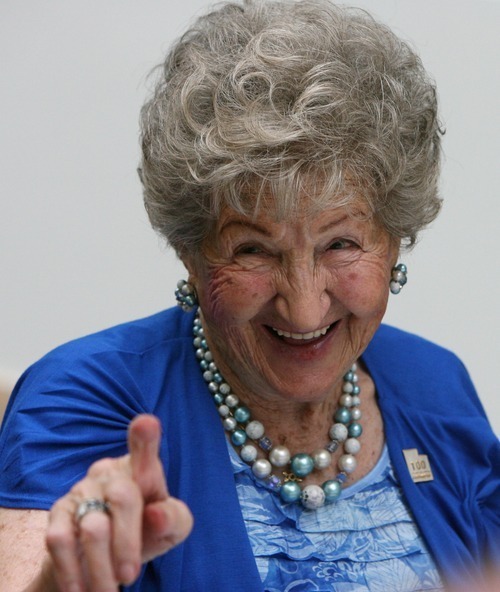 If you know of a centenarian interested in attending next year's party, call 801-538-3910.